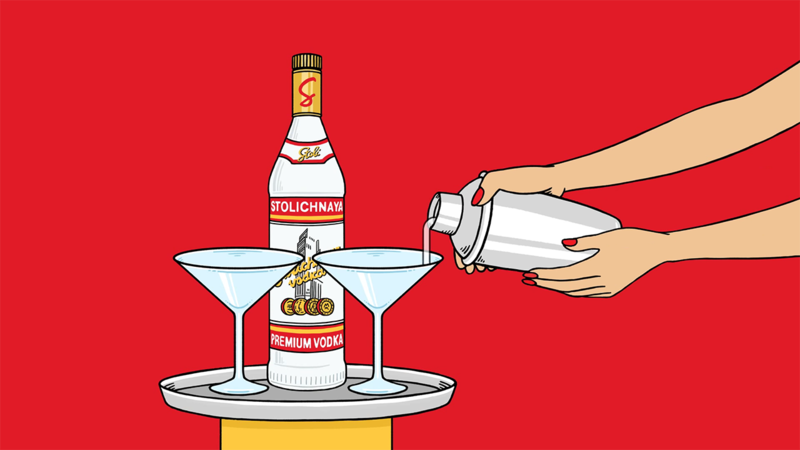 Stoli is trying to get a better feel for mobile advertising—literally. Today, the brand and Horizon Media are launching a campaign with mobile ad network Opera Mediaworks and technology company Immersion that uses haptic technology to make consumers' smartphones vibrate. While watching a 20-second video, people can feel their phones shake when a woman makes a cocktail or when a dog pees. The vodka brand is the first marketer to plug the tactile technology into Opera's network of mobile apps, which will power full-page and preroll video ads in entertainment and sports apps. "We're always looking for new and unique ways to interact and connect with our millennial consumer," said Russ Pareti, brand director at Stoli Vodka. "We felt like this technology fit really well with our digital short campaign." Stoli is repurposing three of its animated short videos that started rolling out last year to test how people react to feeling something physically vibrate in their hands while watching an ad. The spots were created by The Martin Agency. Alex Stone, director of digital activation at Horizon Media, noted that out of the more than 20 animated shorts Stoli has created, three were picked to run as mobile ads based on their previous performance as prerolls. "They're more like entertainment than anything else, more than traditional preroll, so we thought this increases the relevance or the engagement with the brand," Stone said. Mike Owen, evp of North American sales at Opera, said his company has been talking to Immersion for about a year about how to make its ads more interactive. Immersion's technology only works on Android phones, meaning that only a portion of Opera's inventory is open to marketers to buy haptic ads. Sixty-four percent of the ad network's impressions come from Android phones, while iPhones make up 22 percent. The remaining 14 percent of impressions come from other operating systems like BlackBerry and Windows. Owen declined to say how much a haptic mobile ad costs, but he did say, "It's definitely getting an increased price." "We've been out with many marketers talking about this," he said. "The focus is, 'How do we take a story to the next level?'" Still, ads that move and buzz have plenty of potential to annoy consumers, and it's not clear whether people will like vibrating ads. To that point, Horizon Media is running a study with Nielsen to measure if the endeavor is more effective on smartphones or tablets so it can plan for future ads. Jason Patton, vp and gm of content and media at Immersion, said physical experiences make a creative use case for brands. "This is the year that haptics really start to break through," he said. "We're taking advantage of every piece of technology within the phone."